Living with multiple missing teeth can feel challenging and hopeless. Chewing and eating becomes difficult, which affects your nutrition and health. Talking and smiling might feel embarrassing, which affects your personal and professional relationships. Did you know that your oral health is also in jeopardy? For over forty years, Long Family Dental has been providing solutions for patients with missing teeth, and we’ve helped them reclaim their teeth and their lives. Learn more about your options for replacing missing teeth with implant dentures in Cleburne. When you’re missing one or more of your teeth, your oral health is at risk. Without a replacement root, your bone will begin to deteriorate or lose density. This will change the appearance of your face and put your remaining teeth at risk for more loss due to lack of bone support. Without a tooth replacement, your remaining teeth will begin to shift into the open spaces. This puts them at risk for fractures, gum disease, and will cause your bite to become misaligned, which can lead to painful joint issues. Dentures have been the treatment of choice for patients who are missing most or all of their teeth. A denture is a removable appliance in which prosthetic teeth are designed to look like your natural teeth. Dentures stay in place with suction and a snug fit, or sometimes a dental adhesive. While patients appreciate how a denture immediately restores their smile, many also have a hard time learning to talk and eat with their new teeth. Dental implants however, have revolutionized how dentures are worn today because they provide a more secure and stable fit than ever before. A dental implant uses a biocompatible titanium post to replace your root, and a porcelain crown to replace your tooth. Your new root is surgically place into your jawbone and allowed the appropriate amount of healing time to integrate with your bone. Your new tooth is then attached to your implant, and now you have a tooth replacement that closely mimics your natural tooth. 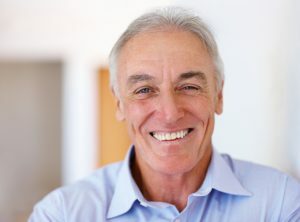 When you choose implant-supported dentures in Cleburne, a few implants are strategically placed into your bone, and your denture is custom designed to snap into these implants. Once in place, your denture will fit securely and you won’t endure the movement or slippage of a traditional denture when you eat, smile, or talk. Dr. Robert Long and Dr. Chris Long can help restore your smile, and guide you through implant treatment from start to finish. We use computer-assisted technology to ensure accurate and precise placement of your dental implants. Dr. Bob is even certified in IV sedation to ensure the utmost comfort during your implant procedure. Don’t live with missing teeth any longer! Call us today to reclaim your smile.